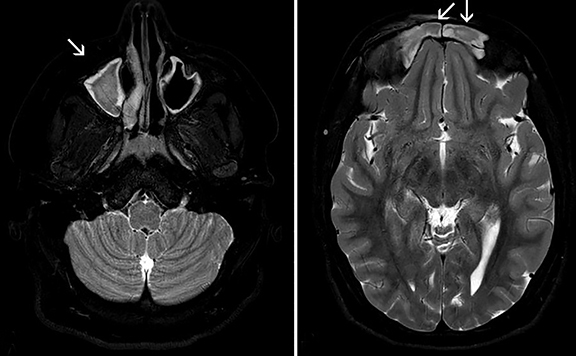 A 14-year-old female presented with a 2-week history of a gradually worsening frontal headache. The patient also reported recent onset of forehead swelling. Initial CT of the head without IV contrast demonstrated opacification of the right maxillary, right ethmoid and bilateral frontal sinuses (Figure 1). 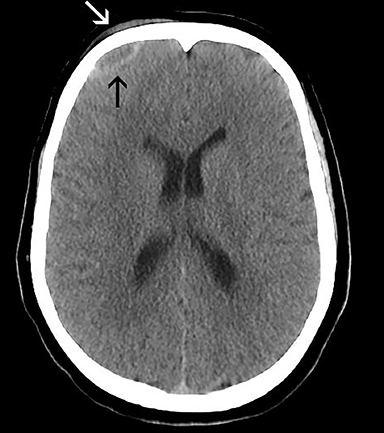 The initial CT also showed a right frontal subgaleal collection [white arrow] with an associated right frontal epidural collection [black arrow](Figure 2). 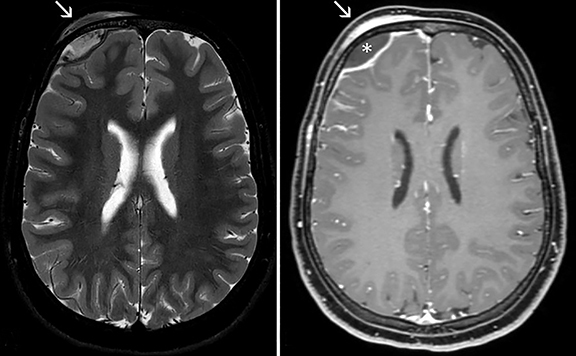 A subsequent MRI with and without contrast shows the sinus opacification [white arrows](Figure 3) with right frontal subgaleal collection and right frontal epidural abscess [*](Figure 4). Pott’s puffy tumor with intracranial extension (epidural abscess). Differential diagnosis includes primary osseous tumor, Langerhan’s cell histiocytosis, and trauma. English surgeon Sir Percival Pott first described Pott’s puffy tumor (PPT) in 1760. Dr. Pott had a special interest in cancer epidemiology and is also credited with describing Pott’s disease, Pott’s fracture, and various malignancies.1 Although first described secondary to head trauma, PPT is usually a complication of acute sinusitis, usually the frontal sinuses, characterized by a subgaleal abscess via anterior extra sinus extension. When extension of the sinus infection occurs posteriorly, an epidural abscess, subdural empyema, intracerebral abscess or dural sinus thrombosis can occur. In addition to infection eroding through the bony sinuses, direct extension secondary to trauma or surgery may be a causative source. Sinus cultures are often obtained intraoperatively and are frequently polymicrobial in nature. Organisms include alpha and beta hemolytic Streptococci, Haemophilus influenzae, Streptococcus pneumoniae, Staphylococcus, as well as less commonly Proteus, Pseudomonas, Fusobacterium and Bacteroides.3 Diagnosis may be suspected following the aforementioned clinical exam findings; however, neuroimaging should be considered to exclude intracranial complication. CT is the diagnostic study of choice, although MRI with contrast may help to further refine the extent of intracranial disease3. PPT is considered a surgical emergency and as such should be treated accordingly. Endoscopic treatment is the preferred modality and may be performed with minimal invasiveness. Management includes abscess drainage, sequestrectomy of affected tissues and bone, as well as broad-spectrum postoperative intravenous antibiotic use for 6-8 weeks.3 Overall, the prognosis is generally good given an accurate diagnosis and prompt treatment. PPT is a relatively uncommon disease that most often presents in teenagers and adolescents as headache, fever, vomiting, forehead swelling with tenderness, periorbital swelling, purulent nasal drainage and mental status changes. These clinical exam findings, coupled with neuroimaging such as CT and MRI, may help to better define the disease process and in turn outline possible treatment approaches. Given the potential severity of PPT, prompt surgical intervention and management is necessary to avoid potential long-term sequelae in these patients. Prognosis is generally good when the diagnosis is made quickly and accurately; followed by abscess drainage, bone sequestrectomy and broad-spectrum antibiotic use. Dobson J. Percivall Pott. Ann R Coll Surg Engl. 1972; 50(1):54-65. Shehu BB, Mahmud MR. Pott’s puffy tumour: a case report. Ann Afr Med. 2008; 7(3):138-140. Keehn B, Killeen Z, Jorgensen SA, Towbin AJ, Towbin R. Pott’s puffy tumor. Appl Radiol. 2018;47(3):30-31. Prepared by Dr. Keehn, Dr. Jorgensen and Dr. Richard Towbin while radiologists at Phoenix Children’s Hospital, Phoenix, AZ; and Dr. Alexander J. Towbin, while a radiologist at Cincinnati Children’s Hospital, Cincinnati, OH.